Life's Abundance cat food is the only brand of cat and kitten food that Pelaqita Persians' uses. Life's Abundance foods are formulated for All Life Stages. Why do Cat Breeders Recommend Food and Other Pet Products? 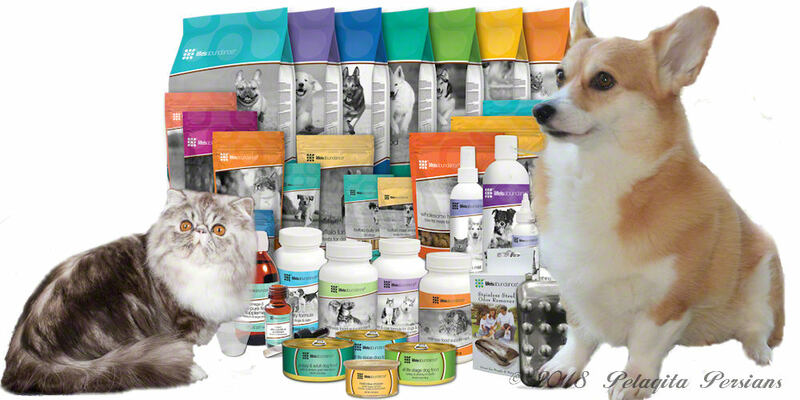 As a former longtime dog, and now, cat breeder, I have been using and recommending food and other pet products for many years for their value and health benefits. As a breeder, I have always tried to be ethical and conduct myself and my cattery with transparency. Recently, a few pet owners have brought the issue of the perks that pet food companies make available to breeders to my attention, so for any confusion, I do apologize. I never considered these perks as a conflict of interest. Furthermore, my cats, their kittens and their health and well-being, are my primary concern and for that, I will not apologize. I believe a quality pet food must support good health, provide a high level of fitness and condition, contain no fillers (corn or wheat and/or gluten), no artificial colors or flavors, be produced with good quality control (no pet food recalls), be formulated consistently, contain natural wholesome ingredients, be nutrient dense so an owner feeds less because of no fillers (corn or wheat), and made in the United States. Over the past 35+ years, I have tried many different products and pet foods forming an opinion about what products work best for my animals and my puppies or kittens. Breeder Programs - What Are They? Breeder Programs exist because after purchasing a pet over 90% of pet owners continue to feed the same food their breeder uses. The pet food companies know that breeders use and recommend that food and their recommendations boost that companies' sales. Most breeders belong to a "breeder program" for the brand of food they feed. These programs vary from company to company. The breeder may get such things as one free bag of food for every six bags purchased, or kitten starter kits, or a wholesale price on 30-40 pound "breeder" bags of food. In my opinion, ethical breeders do not endorse products simply to get a company's incentive. We make our recommendations because we like and use the products. Furthermore, we firmly believe Life's Abundance products are superior. We freely admit we receive a very (very) small comission, but they are not the deciding factor in the products we use or recommend. I believe my knowledge and experience pertain to my comments here. For over 18 years, I have been actively breeding, raising, and showing Persian cats. It took me a while to find a food that all my Persian cats and kittens did well on and one I felt confident in recommending to my kitten buyers. In the summer of 2009, I was contacted by an Independent Representative for Life's Abundance. I vaguely listened to her sales pitch about the food, superior ingredients, and commitment of the company to the health and well-being of dogs and cats, how their breeder program worked, and the fact the company believed in "giving back" (a portion of sales proceeds goes to assist rescue organizations). At the conclusion of her sales pitch, she offered to send me a free bag of food to try, and I, of course, agreed since I was looking for a new food for my cats. The day the food arrived, one of my cats (once again) had a food-related diarrhea. Instead of doing a slow switch over on the food, (since she already had diarrhea), I just pulled the bowl of Royal Canin Persian formula food out of her enclosure and put in a bowl of the Life's Abundance cat food. This cat had a five-week old kitten (Tempest) who was just starting to eat kibble food, so I was interested to see if the kitten could tolerate the quick switch over in food also. Additionally, Life's Abundance uses a "fast-cook" process at low temperatures to help preserve the nutritional value of each wholesome ingredient. Life's Abundance has been in existence since 1999, and not one of their products has EVER been the subject of a recall – either "voluntary" or "involuntary". That is quite a record for a pet-food company, as I have not found another pet food company that has not had at least one product recalled at some time. As a pet breeder and owner, it is essential for me to know the food I am feeding my cats and dogs is healthy, safe, and nutritionally sound or I will not use or recommend it. How Does Life's Abundance Breeder Program Work? The breeder program for Life's Abundance is set up somewhat differently than most other pet food companies I have ever dealt with in over 35 years of breeding and showing animals. The breeder has to become an "authorized representative". The representative receives a "replicator" website which is a duplicate of Life's Abundance' corporate website with the representative's identification number embedded in this "replicator" web site. When a pet parent clicks on the Life's Abundance link on Pelaqita Persians' web site it takes them to "my" replicator site. Life's Abundance charges me $1.95 each month for the replicator site as they process all orders, take care of shipping, answer questions, etc. Because I saw first-hand the difference this food made in my own cats' lives and because I firmly believe, that just like human beings, our pets are what they eat, I decided to became an Authorized Representative for Life's Abundance. Additionally, if food is formulated properly with premium ingredients and no fillers, a pet owner feeds less food to their pet on a daily basis, saving me and my pet owner's money on a cost-per-day, cost-per-month, and cost-per-year basis. The healthier and safer a food is, the healthier the animal or person will be. Due to my belief in Life's Abundance pet foods, I decided that if my kitten buyers would continue to feed our kittens Life's Abundance cat food, I would guarantee the health of my kittens for five years – again, this is because I believed in the food and I knew the kitten would be healthier as a result of a superior diet. If a buyer did not wish to continue feeding Life's Abundance, that buyer would get a one year health guarantee. Life's Abundance sends me an email every time a pet owner orders product through my replicator website and in this way I can ascertain if one of my kitten buyers is in compliance with the five-year health guarantee. Unlike other pet food companies, Life's Abundance does not offer their representatives or breeders free kitten or puppy starter packages; I purchase them for my kitten buyers. Rather than buying food at wholesale (like other pet food company's breeder programs), I pay the same price per bag that my kitten/cat buyers pay when they order through Life's Abundance "auto-ship" program (saving 10%). Instead of free kitten kits, and wholesale prices, or other incentives that other large pet food companies offer, Life's Abundance pays an independent representative a small commission on most items purchased through a representative's web site, including the items the representative buys and I purchase a lot of pet food since all of my dogs and cats eat Life's Abundance foods. After ascertaining the superior product and safety of Life's Abundance, this was one incentive: to get a little bit back for all that I pay out every month for food and other products for my dogs and cats; it was not to make money off of my kitten buyers. Basically, the commission paid to me each month covers most of the cost of the food that I am feeding my cats (not dogs). Additionally, because we buy and use so much product ourselves (with our cats and dogs), what we spend each month is pretty much returned to us via the monthly commission on those same products. I want to make sure that everyone understands, that while I am an Independent Representative for Life's Abundance, I do not recommend products that I am not using myself and do not fully believe in and support because of their superior ingredients and health aspects for my animals. I will never apologize for feeding a safe and nutritionally sound food to my dogs and cats nor for recommending those same products to my kitten buyers.